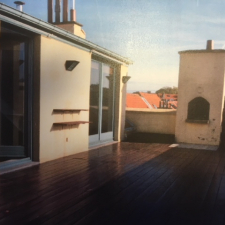 Rue d'Espagne 93 renovated apartment 100 m2 + 45 m2 terrace facing south : hall, living room, fully fitted kitchen, bedroom, bathroom, WC, cellar. EUR 1045 + 125 provisions. Tel. 00 32 475 70 24 86 ; no agencies please.